Date Can be Subject to Change! Budapest Sziget Festival takes place on Óbudai Island (aka Hajógyári Island) in Óbuda, northern Budapest. This year the festival celebrates its 27th jubilee welcoming visitors with around 1 500 programs on 50 venues across the island. there’s even a small beach where you can splash in the Danube. Fever Ray (S) – Aug 14., Tuesday – Karin Dreijer, Swedish singer, musician, songwriter. Why this festival is called Sziget, meaning “island” in Hungarian? Why has Sziget Festival become so popular? The main reason is that it offers the best-value for your money regarding similar events in Central and Eastern-Europe. Moreover, this festival represents an island in a metaphoric sense. Every year thousands and thousands, mainly the young generation come to Budapest in the middle of summer to enjoy the freedom it offers over the 7 days. and lots of fun on an island in a hip city. 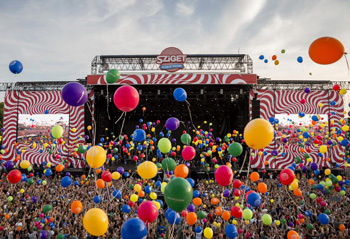 Sziget has won numerous awards in previous years. The latest one is the Artists’ Favourite Festival 2016 title by the European Festival Awards. See more details about the lineup, programs, services, facilities, and prices below. Why Is Sziget So Popular? No matter what music genre you like to listen to, you’ll find that appeals to your taste. Each year several internationally recognized music stars perform on 5 stages. Sziget is a meeting place where you can let yourself go and do what you’re feel like doing. No one’s going to stare at or criticize you. It’s also a place of learning about each other and the world. More than 30 internationally well-known bands will be performing on the Festival this year. Main Stage: the biggest stage where the international stars perform. World Music Main Stage: bands from all around the world stage on this outdoor venue. Europe Stage: this is where you’ll find the new generation of music from countries all over the continent. New, exciting, unique performers and concerts. Telekom Electronic Beats Arena: a place for electric dance music – techno, trance, house, on-stop party by young DJ talents as well well-known big names. OTP Bank A38 Stage: one of the most popular concert venues of the Sziget where you can enjoy various music genres from world music to punk. Colosseum – this is the most spectacular venue of the Sziget, built from pallets by the Hello Wood group. Progressive electronic and underground music will be played here. Campfire – a chill-out spot around a campfire where you choose who provides the music. LightStage – next to the entrance of the Alternativa Camping, a cool recreational area complete with an Italian restaurant and bar and a vegetarian-gluten-free bistro, concerts during the day by young Hungarian and international talents. Papageno Classical, Opera & Jazz Stage 11 – 15 August, starting at 16.00 with a choir performance- here you can discover the world of classical music and jazz, you can conduct a symphonic orchestra and you’ll realize that Beethoven, Mozart or Puccini are just as cool or any contemporary pop-rock star. You can also listen to many local music talents you’ve never heard of. just walk around and contemplate passersby. Last but not least, you can make friends from all over the world. Why has Budapest Sziget Festival become so popular? It’s more than just a few-day long pop-rock festival. It has a unique atmosphere, the so called “Sziget feeling”. Children are welcome too. There will be plenty of programs for them (e.g. puppet theatre). Entry is free for kids under the age of 11 (born after 15. August 2007). They need to wear a child wristband – available at the entrance – with their name and their parents’ phone number written on it. 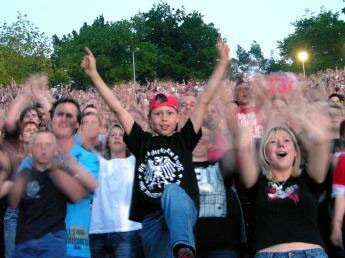 If you don’t want to take your kids to a certain event leave them in the day-care where qualified personnel looks after them. TIP: Stay at a Family Camping in a nice shady spot, complete with extra toilets and showers, 24 hr reception, friendly, English speaking staff and animators, playground, tables, dedicated area for the kids to take a nap while the staff looks after them. Similarly to previous years’ festivals you can enjoy a whole range of programs other than music. International and a Hungarian new circus companies (Grotesque Gymnastics)will perform in the huge tent set on the island between 10. and 17. August. Play darts, board games and poker (18+) or learn new tricks with the Rubik Cube. You can enjoy the special experience in a luminarium (using sunlight through colourful plastics and foils) created by the Nothingham-based Architects of Air for the 13. time. It will be open during the 7 days of the festival from 12.00 to 01.00 (am). In the northern corner of the island a whole chill-out area welcomes everyone. just chat by a cup of tea. If you want to experience the essence of the Festival camp right at the spot on Hajógyári Sziget, Óbuda. If you’d rather have accommodation in downtown Budapest you have many options. See our Budapest hotels guide. Budget hotels and hostels are very popular accommodation options, so to ensure you have a place to sleep at, book your lodging well in advance. Budapest has many budget hotels, hostels and pensions if you want to save on lodging. If you want to save even more consider staying in an apartment and sharing the cost with others. See our guide to apartment rental, and tips on finding a cheap Budapest apartment. Note: prices include VAT, if purchased online a 1 EUR handling fee will be deducted. 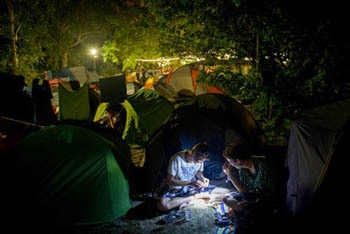 You can sleep in a tent in the camping area and you can use the camping facilities. after 31. May and on the spot: 299 EUR. all regular festival days included, – 1 (08 August), 0 days(09. August) are not included. after 31. May and on the spot: 199 EUR. Camping and use of shower are not included. Daily ticket is valid from 06.00 on the given day till 08.00 the next day. You can pay for food, drinks, services, entry tickets with bank card or cash. Guarded Lockers: 16-25 EUR fix price for the 7 days. computer monitored safety locks to store your belongings in. Pay Watch – 29 EUR: No need to carry cash with you, besides showing the time, the watch also serves as a pay-card, an exclusive payment device. The balance remaining on your watch is refundable until the end of the festival and cannot be transferred to subsequent festivals. Blanket: 5 EUR, fleece, measures 130 x 170 cm, 4 colors available: blue, green, yellow, fuchsia (you can choose the one you like on the spot). Airbed: measures: 20 EUR: 191 x 137 x 22 cm, help to inflate it on spot will be available. Camping Mattress: 5 EUR: foam camping mattress, rolled, 180 x 50 x 7 cm, 4 colors: blue, lime green, red, fuchsia (you can choose the one you like on the spot). Travel Sheet: 10 EUR: also serves as a very thin sleeping bag, 190 x 75 cm, grey colour. Sleeping Bag: 15 EUR: envelope style sleeping bag, 190 x 74 cm, 3 colors: blue, green, black (you can choose the one you like on the spot). More information on Tickets and Passes: Sziget Festival Official Site. The Sziget City Pass is a travel and tourist card in a wristband form allowing you to enjoy the event as well as Budapest to the fullest. one time free then discount entry (20 %) to the thermal baths (Gellért, Széchenyi, Lukács, Király, Rudas), outdoor pools-beaches, and museums. The pass can be bought for 2 days, or 13 days depending on the length of your stay. Free travel on the shuttle buses between the airport and Hajógyári Island. One-time free entry to one of the spas, and outdoor baths, then 20 % discount on the ticket to every bath and beach. 20% discount from entry ticket to Csodák Palotája/Palace of Scientific Wonders (1222 Budapest, Nagytétényi út 37-43) until 31st August! Who Should Buy the City Pass? shops, markets that you wouldn’t want to miss. The pass is great value if you plan on staying in the centre instead of camping on the island. You can use public transportation to get to the festival and back to central Budapest whenever you wish without having to bother with buying tickets. 39 EUR for 13 days: 05 – 17 August. The pass can be purchased online (see link to the official site above). You get a voucher after payment that you print out and can exchange it for the wristband upon arrival to Budapest at several points: airport, train stations, the festival entrance. No need to buy public transport tickets, you can start using your pass right away. Take the Szentendrei Suburban Railway (HÉV in Hungarian) line from Batthyány tér (M2, red metro line) for five stops, get off at Filatorigát stop. From there follow the crowd along Mozaik Street through K-Bridge! Tram 1 and 1A also provide good connection to the city centre. You can get to Hajógyári sziget (H-Bridge entrance) by shuttle buses, from Liszt Ferenc Airport Terminal 2. You can use the service of shuttle buses free of charge with a CITYPASS wristband. The journey is cc. 44 minutes. See the detailed schedule of the Airport – Sziget transfer vus. Note: You can use the public transport free of charge with your City Pass on 17. August till midnight. 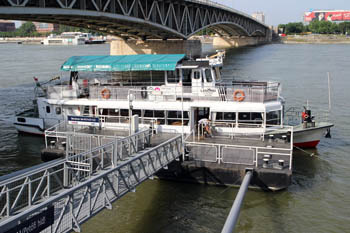 You can get to the city center of Budapest by the special Sziget boat service between 09 – 15 August from 12.00 to 16.00 during the Festival. the venue of the Sziget, Óbuda island. The journey time is around 33 minutes. On Jászai Mari Square you can hop on tram 4 or tram 6 to get to your destination. Additional information on how to get to the festival venue! During the years the Sziget has evolved and numerous services and facilities have been set up on the island area to make your stay more comfortable. On-site Box Office – here you can buy your daily ticket. Open every day between 8.00-16.00. Information – if you need help or have any questions. Medical Help: If you don’t feel well drop in the Medical Base next to the main stage where qualified nurses and doctors will help you. Banking: There is a K&H bank office (open 10.00-18.00) set up on the island during the festival. There are ATMs on 10 spots on the island and you can use them 24 hours a day. Post Office – you can buy stamps, postcards, envelopes, phone cards and send your postcards and letters. Left Luggage Office and Safe Deposit: To keep your belongings safe leave your luggage in the Left Luggage office or in the Safe Deposit (for smaller items). Green Info Point: open 11.00 – 23.00 – The Sziget Festival deems environmental protection a very important issue and the organizers try to do many things to keep the environment clean during the festival. There are also various programs and projects focused on green issues every year. The Green Info Point provides information on the Green Zone program and you can participate in waste exchange, environmental protection quizzes and games etc. Hungarian Language First Aid Tent: between 12.00-22.00 every day Language experts will help those who want to complete a crash-course in Hungarian language. Laundry Service: Drop your dirty clothes at the Information, the staff will have it cleaned with a laundry service. You’ll be told when to pick up the clean clothes. There are also two self-service laundry spots on the island. Board Games House: if you don’t find anything other to do or if it’s raining go to the game house. Wedding Tent: Yes, you can even get married during the Sziget Festival. Numerous street food stalls offer tasty meals at affordable prices every day. A one-course meal (meat dish with garnishing) costs around 900-1300 HUF. Vegetarian gluten and lactose-free dishes will also be available. There are also many snack, tea & coffee vending machines in the area of the festival. I’m sure you won’t have to search for long for places selling beer, and other alcoholic beverages since carousing and drinking is sort of part of the festival’s image. Note that you’re allowed to be served and drink alcohol in Hungary if you’re older than 18. In the Aldi shop you can buy pastries, yogurts, sandwiches, fruits and veggies, drinks. What’s more you will be treated to grilled food at the grill area. Here you can buy toiletries, handkerchiefs, and all other important items to be comfortable during the festival. TIP: See more Events and Things To Do in August!